I found this section of Otto Dietrich's Philosophical Foundations of National-Socialism very difficult, not only to translate but to understand after I had translated it. (Translation was complicated by apparent misprints, including absence of some necessary commas and I had to read it many times to arrive at what I think is a correct understanding of the whole section. I think that this is because of the knowledge and assumptions that Dietrich took for granted in his audience and therefore did not articulate, which are unknown to Americans. I think that a German philosophical audience of 1934 would certainly have had more of the necessary backgound information for a clear understanding of what Dietrich meant, whereas for a 21st-century American audience not trained in the German intellectual tradition, some of the references are totally obscure. In particular, Americans might not immediately understand what Dietrich means when he talks about the controversy over defining sociology, or why this is relevant. Americans may also be dubious about Dietrich's use of the term universal to mean something different from our individualistic understanding of it (which I think is also a problem that Americans encounter when trying to understand some of the German Idealistic philosophers). Nonetheless, I think it is possible to get something out of it. For example, the statement that man is a collective essence (which could also be rendered as collective being), not an individual essence -- and that only the community, not the individual, is real -- points to the premise of sociobiology or evolutionary psychology, that the gene-pool, not the individual, is the unit of survival and evolution. One would like to have a fuller explanation of how the new community-based thinking necessitates the reorganization of academic knowledge. There is only the briefest mention of that here: new and different approaches to history, politics, law, and philology from the perspective of race and community. I should add though, that H.S. Chamberlain, in his Aryan Worldview, had complained years earlier about the way academic knowledge was compartmentalized into distinct disciplines, which Chamberlain seemed to think robbed the particular disciplines of unity and meaning. The new worldview facilitates restoration of unity and meaning, with some reorganization, according to Dietrich. His use of the term Einzelwissenschaften (individual sciences) seems to imply an analogy to Einzelwesen (individual being), so that the scholarly disciplines are reunified with the whole of knowledge in the same way that the individual man is reunited with his community, in this worldview. By the way, the German word normally rendered as "science" (Wissenschaft) really refers to any field of scholarship. When science in the usual English sense of physics and biology is meant, the term is "natural science" (Naturwissenschaft). Meanwhile, "humanities" (Geisteswissenschaft) apparently includes what we somewhat artificially distinguish as social sciences. Now that you already know some the things that you are likely to find puzzling here, you won't feel stumped when you encounter them! I have written a synopsis of this section to make it even easier to digest. Man cannot exist as an individual, only as a member of a community. Races, peoples, and nations are therefore more real than individuals. Therefore universalistic thought must replace individualistic thought in philosophy, and the organic view of the world must replace the mechanical view. But do not misunderstand what is meant here by universalistic. Community-consciousness that is fundamentally rooted in biology. Sociology was the beginning of an attempt to understand man in his collective nature, but it was in some ways on the wrong track, because "society" is still an essentially individualistic term. "Community" by contrast denotes an organic unity. Recent thinkers who pointed the way to the new community-conscious thought are Johannes Rehmke and the National-Socialist Paul Krannhals. But really it has been a long time coming, foreshadowed by Meister Eckhart, Kant, and Fichte. With the turn from individualistic to community-based epistemology, the divisions of scholarship will have to be reorganized in a way that makes sense within the new worldview. This new mode of thought is valid for all races and peoples, even if not all are yet able to recognize it. Underlying individualistic thought is the premise, taken to be self-evident, that man is an individual essence (Einzelwesen). This premise -- however firmly it may even be rooted in the universal conception -- is false and based on a catastrophic error in thinking. Man confronts us in the world not as an individual essence but as a member of a community. Man is in all his actions a collective essence (Kollektivwesen), and is utterly unthinkable except in this way. Man by definition therefore lives in community with others; his life actualizes itself only in the community. Community is a concept to which the whole history of humanity is subordinate; it is the form in which human life runs its course from cradle to grave, without which it would be unthinkable. The actual givens that we find in the world are not individual men but races, peoples, and nations. Man as individual may be an object of research for the natural sciences (Naturwissenschaften). But in the humanities (Geisteswissenschaften) he is an object of cognition only as a member of a community, in which his life has an effect and usefully (praktisch) runs its course. The humanities, and especially philosophy in its epistemological ground-laying, must take account of this fundamental fact, if they want to assert their prominent position in the intellectual life of the German nation, and to maintain a living, fruitful connection to its evolution. Universalistic thought, community-conscious thought, must take the place of individualistic thought; and the universalistic -- or if one wishes, the organic -- picture of the world must take the place of the mechanical picture of the world.. I would like to emphasize beforehand that the term universalistic, which I shall continue to use, is not identical with the empty umbrella-term, human society or humanity, but instead that universalism here stands as the terminological opposite of individualism. The term universalistic represents a concept that is actualized not in "society" (Gesellschaft) but in community (Gemeinschaft). The fact that individualistic thought has misused the term universalistic for its own purposes will not prevent me from restoring it to its actual meaning. We shall see later how the tremendous ideological and revolutionary happening of our days points toward such a new ground-laying of thought that is founded upon community-consciousness as a fact ultimately rooted in biology. Now, the scientific consciousness of how strongly the individual is bound to a whole (Gesamtheit) is not in itself a new discovery that I could claim for myself. The social or "gesellschaftlich" mode of interpretation has long been one of the most fundamental but also most controversial problems in many of our individual sciences (Einzelwissenschaften). In the "universalistic conception of the state" as for example Othmar Spann teaches it, in the science of law, in political economy, in social psychology, and so on, it has produced results for decades, but without any inner connection to National-Socialism's universalistic-organic thinking based on race and biology. In sociology, which Comte already established, the growing importance, the rising scientific interest in the problems of society congealed, as is well known, into a special science. How much this problem and the instinctive consciousness of its importance has been occupying minds, one sees from the decades-long scientific dispute over determining the object of sociology as a science in its own right. One faction proclaimed that all sciences of human affairs were only parts of an all-encompassing science of society; everything that was not natural science, they said, should be housed in this new science, "sociology." Others, by contrast, limited sociology's area of knowledge to the forms of human society, while the remainder entirely denied to sociology the right to be a science, and they wanted to have it regarded only as a method of social-scientific research. As we see, the problem has long been recognized and felt by science. Its solution has been attempted sporadically and piecemeal, but never radically and comprehensively completed for epistemological thought. While the fundamental distinction between community and society was clarified for science by Tönnies, it was Eucken who laid the notional groundwork for it, but without the science having recognized the worthlessness of the concept of society (Gesellschaft) for its ground-laying work. Here the National-Socialist worldview is called to perform the scientific breakthrough, and to raise universalistic, community-conscious thought finally to the throne of true cognizance in the humanities, to which it is entitled. The scientific ground-layings of such a universalistic foundation for philosophical thought, upon which a new construction in the spirit of our age can take place, have been present for a very long time. I name here the philosopher Johannes Rehmke, who, in his works Philosophie als Grundwissenschaft and Grundlegung der Ethik als Wissenschaft, counters in compelling, strongly scientific argumentation, but also in all pointedness, the erroneous view that man is an individual essence. In his doctrine of the community's rules of life he has created valuable ammunition for a universalistically oriented philosophy. "Every man is indeed individual, but not an individual essence," says Rehmke. "We know that in the world without exception what truly has an effect (das Eigentlich-Wirkende) is a universal," and furthermore, "In science, man the individual essence, as a type, must be placed at the root of all evil. Dreaming and poetizing in philosophy must come to an end. Facts are all that matter even in philosophy." Communities, races, peoples, and nations, as historical and material actualities, are such a fact that cannot be further reduced. And I would also like to mention here a thinker who has unfortunately left us too soon, the young philosopher Paul Krannhals, who died a few months ago in Munich. It is for me an honor-bound duty to introduce to the broader public this man who in the years of his creative activity was so closely connected to us National-Socialists, and to make a place for his work in the philosophical ground-laying of National-Socialism. His book published in Munich in 1928, Das Organische Weltbild, I would like to designate as the first correctly envisioned attempt from a National-Socialist perspective scientifically to clarify and to present the organic or universalistic conception of the world as the one that internally conforms to our German way of life. "The individual as such," as Krannhals also says, "has neither the right nor the duty to exist, since all right and all duty derive first from the community." He demands organic thought as an expression of the German soul's awakening return to mindfulness (Wiederbesinnung) of itself. Not in the rational orientation toward the world does he see the inmost core of the German essence, but instead precisely in that soul's non-rational comprehension (Erfassung) in experience. Instinct and intuition here become active powers of cognition. "The philosophical return to mindfulness of the German present is the return to mindfulness of the totality of our soul. Its goal is the rule of the ethnically distinct soul of our kind (Gattungsseele)," what Rosenberg calls the race-soul (Rassenseele). As Krannhals assigns the crucial place among the powers of the German spirit to the creative power of the German soul-type (Seelentum), of the German folk-soul (Volksseele) that is the root of German culture, so does he demand education into community-consciousness and the development of all powers of the soul for this. "The creative Nordic soul-type has put its impression on a series of cultures and will do so also in the future." "It is the inestimable merit of the great German artworks that they make us experience most deeply the inner connectedness of all generations of German lineages with each other and with the soil of our homeland." Type-consciousness, on the other hand, which is acquired in the gradual accumulation of hereditary qualities, can be preserved only "if the ethnic character's racial foundation, its biological root, remains vigorous." Krannhals makes the attempt, magnificent in conception, at a national organization of knowledge (Wissen), so that knowledge too is organically connected to life and enters into the process of life. He poses the question: "How must we organize knowledge so that its maintenance and promotion correspond to the material and ideal aspects of the people as a w, so that the unfolding of all its features to the highest degree can bestow the greatest possible service to the people?" We see from these few hints how here a young German philosopher, whom the University of Marburg awarded a doctorate honoris causa just a few weeks before his death, grasped scientifically and philosophically the essential content of the National-Socialist worldview, and fashioned it into the foundation of a universalistic-organic picture of the world that does justice to the spirit of our age. It is not a complete system and it did not wish to be one, but it is a beginning and shows the task at which we must build. Such an organic construction of ideas (Gedankenbau) into a National-Socialist picture of the world originates from the mentality (Geisteshaltung) of the best philosophers of the German tongue, whose German soul-type could not be suffocated by rational and individualistic thought. In Cologne circa 1300 the Dominican prior Meister Eckhart, the philosopher called by us the discoverer of the German soul (Seele), taught about the ardor of the German soul (Gemüt), about the "pillar of the soul" and about the "will that is capable of all things." Kant's moral law: "Act in such a way that the maxim of your will is at all times applicable simultaneously as the principle of a universal legislation," is an almost classical formulation of National-Socialist ethics. The philosopher Fichte is both preacher and prophet of the nation. He demands that the scientific situation be understood not according to the letter but according to the spirit, that it ought to encompass the whole man. His principle, "I do not want merely to think; I want to act," epitomizes the National-Socialist spirit. His demand that the state organize labor so that everyone can live from his own labor, as he demands in der Geschlossene Handelsstaat, is practical National-Socialism in the best sense. All of that is not individualism, not liberalism, but instead universalistic, organic thought in conformity with the National-Socialist worldview as Alfred Rosenberg has expounded it in his works in so many fields of art and science. Only in this universal turning of epistemology away from individualism to universalism can the revolutionizing of minds be completed also in the field of science. That is because the philosophical spirit of an epoch is also always crucial ultimately for the structure and the systematization of the particular fields of research. From this new ground-laying of thought from the perspective of the community in the age of the national and social revolution, we can access and meaningfully articulate the world of the mind. "There is no world-history in the proper sense, instead only the history of various races and peoples," says Rosenberg regarding the science of history. Consequently racial doctrine and racial research will necessarily be one of the most important fields of research of the scientific world. The univeralistic-organic conception of the state produces its result in the doctrine of the community of the people (Volksgemeinschaft) as the essential foundation of the state. It is from the community, not from the individual, that the science of law derives its principles and tenets. The science of law takes not the individual but the social community as its point of departure. Philology has the mission of educating the youth into community-consciousness, into community-thought, and so on. All these fields of knowledge thus gain their unity from one root, from that root underlying National-Socialist thought and determining its picture of the world (Weltbild): from the community, the only real sphere of human life on this Earth. Such a new ground-laying of philosophy however hardly remains limited to the confines of thought pertaining to a specific nation, even if it originates from that. It is a universally valid epistemological principle that is valid for all communities and applicable to all nations, even if their political evolution today is still not ripe for such a community-thought. For not only the life of peoples, but also the human power of comprehension is subject to progressive development. The German nation is far enough along to be able to make this ground-laying step in the sphere of scientific knowledge. It matters only that the newly acquired cognition, which today seems to be still impossible for a different kind of thought to recognize, is correct. I believe that I have given some evidence for this correctness. 1 The distinction between society (Gesellschaft) and community (Gemeinschaft) is very important in German social thought. Gemeinschaft, community, connotes a much deeper kind of relationship than Gesellschaft, society. A National-Socialist term that intensifies the distinction is Volksgemeinschaft, community of the people. A term that intensifies the distinction in the other direction would be Aktiensgesellschaft, which means joint-stock company. A Gemeinschaft is a group of persons deeply linked to each other, whereas a Gesellschaft is a group of persons united by only external, practical considerations such as gaining money. It is important to note that in National-Socialist discourse, society and community are not interchangeable terms. 2 Ferdinand Tönnies (1855-1936), famous for differentiating Gemeinschaft and Gesellschaft, has been highly influential in Germany but is practically unknown in the anglophone world. Notwithstanding the seminal value of his work for National-Socialist thought, Tönnies was a Social-Democrat who had friction with the National-Socialists -- which may be why Dietrich, although giving due credit to Tönnies, did not omit to mention that Tönnies' thinking was derivative of Eucken's. 3 Rudolf Christoph Eucken (1846-1926) was a philosopher who was awarded a Nobel Prize for literature in 1908. 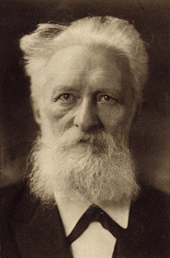 4 Johannes Rehmke (1848-1930) was a philosophical psychologist who wrote many books. For his doctoral thesis (Zürich, 1875) Rehmke wrote a critical study of Eduard von Hartmann's theory of the unconscious, and for his Habilitation (Berlin, 1884) wrote a treatise titled Die Welt als Wahrnehmung und Begriff (The World as Perception and Concept). He joined the faculty of the University of Greifswald in 1885, and became rector of the university in 1898, which he remained until forced into retirement in 1921. 5 Paul Krannhals (1883-1934) having studied chemistry, developed the foundation of his philosophy while a prisoner of war in Russia. In the period 1920-1925 he was a newspaper-editor. His book Das Organische Weltbild (The Organic Picture of the World) according to Dietrich was published in 1928. In 1929 Krannhals cofounded with Alfred Rosenberg the Kampfbund für deutsche Kultur (Alliance for German Culture) and was involved with the National-Socialist students' organization. In 1934 he was a speaker in the National-Socialist teachers' organization, and copublisher of a periodical called Die Sonne. The department of philosophy at Philipps-Universität Marburg awarded him an honorary doctorate shortly before his death, in 1934.